I rarely dress up asparagus; it has such a wonderful flavor that it feels silly to complicate it in any way. But, as the first warm months carry on, cooks and farmers, all eagerly anticipating the next wave of crops, begin to grow a little weary of asparagus. For this dish, I drizzle the grilled spears with a sauce that I made up one day when my wife was desperately hungry and the pickins were slim in the kitchen. We had olive oil, hot sauce, and a little grated Parmesan. I mixed them all together to make a dipping sauce for bread, and she loved it! It is now a staple in our house and plays equally well with just about anything. Bring a pot of water to a boil and season it generously with salt. Add the asparagus and cook for 1 minute, then drain. 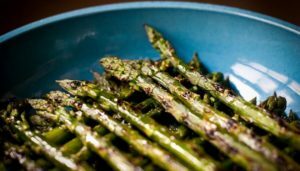 Coat the asparagus with 1/2 tablespoon of the olive oil and cook the spears on the grill directly over the coals of a medium fire until they begin to char, about 4 minutes. Remove the asparagus to a platter. Mix the remaining 2 tablespoons olive oil, the hot sauce, and Parmesan and stir to combine. Pour the sauce over the asparagus and serve immediately. Reprinted from Where There’s Smoke, with permission from Sterling Epicure, copyright © 2013.